We eat beans all the time. Sometimes out of a can, sometimes dried beans we soak and cook with, and sometimes fresh. It is bean growing season now. Peas are gone, the plants grew and grew, we gave out peas in the CSA for about 6 weeks, but now it is all about beans. I picked a bunch on Friday night and will pick more today and again Wednesday. 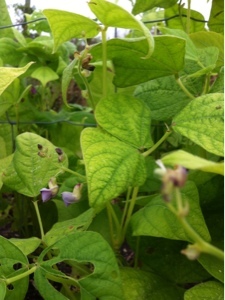 The little flowers indicate more beans are on the way. As with most vegetables grown now, a farmer can select from a wide variety of any thing planted. 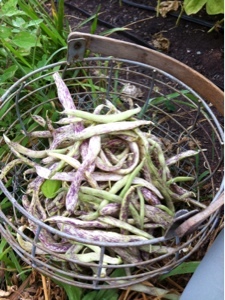 In the past we have grown fava beans, but the beans mold before we pulled them. These are a variety called dragon's tongue, a type that looks cool, tastes sweet and will keep growing and producing more beans as long as we pick them regularly. 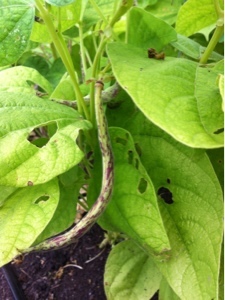 There are other kinds we have in the beds too, bush beans and climbers, each one is the kind that keeps growing and producing until the nighttime temperatures stop them. Not certain what they look like cooked as I just ate some raw, standing in the garden.